There are few British bands with a more fascinatingly tangential history than Wire. Rising to prominence during punk’s peak year of 1977, but possessing considerably more in common with the eclectically minded artists now often bracketed together under the term of post-punk, Wire’s trajectory has been characterised by periods of intense activity followed by lengthy hiatuses. In each new phase of work they have pursued often quite contrasting sounds and approaches – and, in the 1980s at least, sometime with decidedly patchy results – but always with a sense of vaulting ambition and an undimmed interest in ideas that put many of their contemporaries to shame. The three studio albums released in their first phase – Pink Flag, Chairs Missing and 154 – remain set texts for anyone wishing to gain a deeper understanding of late 1970s musical currents. Fizzing with striking musical ideas and a growing mastery of atmosphere – often a profoundly unsettling one hinting at some unspoken dread that is particularly apparent on 154 – these albums are testament to a group whose total was always more than the sum of its parts. The contrasting personalities of the four members during the first two decades of the band’s history – Colin Newman (guitar/vocals), Bruce Gilbert (guitar), Graham Lewis (bass/vocals) and Robert Grey (drums) – meant that Wire was an always unstable alloy. But at their most inspired – the bleakly disturbing ‘Practice Makes Perfect’ and ‘Being Sucked in Again’, the unexpectedly breezy art-pop of ‘Outdoor Miner’ and ‘Map Ref. 41°N 93°W' – there was no one to touch them. As with practically every major act of their era, the 1980s were less kind as Wire struggled to adapt to the production mores of the time. An over-reliance on programming and drum machines lends much of their 1985-1992 phase output a curiously detached and static quality, and the resulting reduced role for Grey – always a phenomenal live drummer – ultimately led to him quitting the band. Fortunately, a third and continuing return to active service in 1999 – with Grey fully restored as the engine room of the Wire sound – has been much more satisfying, both artistically and commercially, as Wire have rightly come to be seen as one of the most creative bands of their generation. Somewhat unexpectedly, this has been achieved despite the exit of Gilbert – generally regarded as their most experimentally-inclined member – in 2004. His permanent replacement, Matthew Simms, is perhaps the most conventionally musically gifted player the band has ever had, lending much of the group’s recent input some deliciously unexpected but entirely apposite sounds and textures. But it was a series of three EPs recorded before, during and after Gilbert’s departure, entitled Read & Burn, that signalled the band’s return to its finest form since the late 1970s. 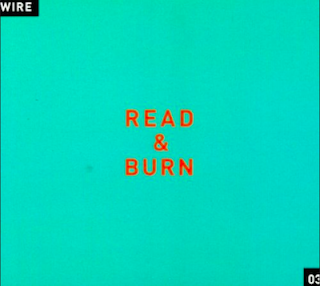 A great deal of the material included on Read & Burn 01 and Read & Burn 02 would ultimately surface on 2003’s astonishingly brutal Send, which is by some distance the hardest and most uncompromising release of Wire’s long career. Primarily based around simple but effective Gilbert guitar riffs, Send was shaped by Newman in the then-new Pro Tools recording software at his newly-built home studio – a laborious process that yielded jagged and jarring results. Wire were back, these releases seemed to say, and in a far bolder way than nearly all of their contemporaries. It is, however, the later Read & Burn 03 EP – released in 2007 – that remains my favourite of the series. Incorporating the final contributions to the band made by Gilbert, this third EP represents yet another decisive evolution, with a more electronic feel welded to some of the band’s most striking melodies in many years. Comprising four tracks and a total duration of 25 minutes, the result is an entirely compelling musical statement. If ‘No Warning Given’ and ‘Desert Diving’ are relatively accessible, electronically-treated pop/rock songs, the opening ’23 Years Too Late’ is unlike anything else in the Wire canon. Over nearly 10 minutes and several distinct sections, Lewis speak-sings some of his most beguilingly abstract lyrics, periodically giving way to Newman’s more traditionally soaring choruses. Given a suitably euphoric remix one can even imagine it might have become what used to be termed a ‘dancefloor’ hit, but even in its original form here it is one of the most exciting examples of post-‘90s electronic rock. Although Wire have yet to release any further EPs, the digital music era has seen an increasing number of artists rediscover the joy of the shorter-form release. Robert Wyatt has often spoken of the more concentrated pleasures to be derived from working on four or five songs at a time, and he has made a number of wonderful EPs himself (collected in the late ‘90s in the terrific box set entitled – reasonably enough – EPs). In a period where listener interest in a full album has significantly waned, while the one-two punch of a single may feel a little too transitory, the EP constitutes a logical compromise for acts wishing to make a serious artistic statement. If there are many of us who continue to mourn the seemingly terminal decline of the album as a coherent body of work lasting 40 to 50 minutes, the revival of the EP does offer some cause for optimism in what can often feel like a period of time in which the significance placed on music is continually being downgraded in favour of background pacification and portable convenience. As for Wire, the group has gone from strength to strength over the last decade, touring extensively and releasing six excellent albums, of which Red Barked Tree (2011), Change Becomes Us (2013) and Wire (2015) are arguably the finest. With work set to begin on their 17th studio album later in 2018, they show no sign of lapsing into inactivity once more – this third phase representing a creative renaissance unrivalled by their post-punk peers. For now, those curious listeners wishing to identify a starting point from which to investigate the considerable Wire back-catalogue could do much worse than acquire a copy of Read & Burn 03. 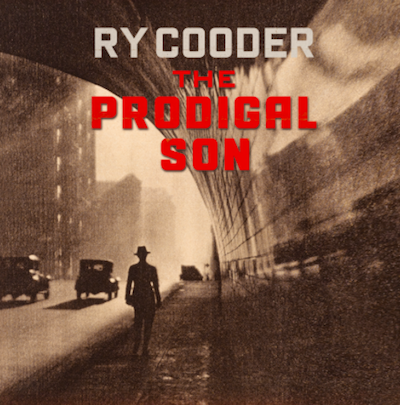 Speak to the more casual listener about the work of Ry Cooder and they are most likely to cite his extraordinary collaboration with Cuban musicians in the Buena Vista Social Club project, or his evocative 1980s soundtracks for directors including Wim Wenders (Paris, Texas) or Walter Hill (Crossroads). The more well-informed might also refer to his brief tenure as a member of Captain Beefheart’s Magic Band, or his productive sideline as a session guitarist for Randy Newman, Little Feat, James Taylor, The Rolling Stones and countless others. Mentions of his post-2005 solo career renaissance are likely to be fewer and farther between, but it’s surely only a matter of time before that changes. Having busied himself with soundtracks and collaborations since the 1987 release of Get Rhythm, Cooder’s return to solo formation in the Noughties with Chávez Ravine was as delightful as it was unexpected. Like many of his contemporaries, Cooder had succumbed to the overly bright and somewhat synthetic production tropes of the era on some of his later 1980s albums, but here he was fully restored with a live, organic, warm sound that put his instrumental skills – and those of his distinguished guests – to the fore. 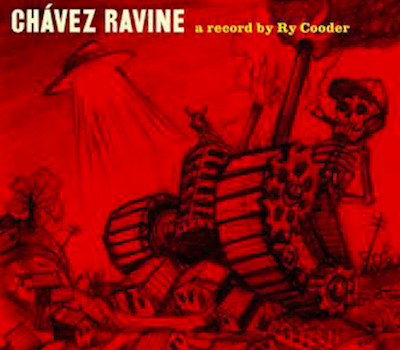 Drummers Jim Keltner and Joachim Cooder (Ry’s son), trumpeter Jon Hassell and vocalist Lalo Guerrero were among the contributors to an album that told the story of Chávez Ravine – a Mexican-American community demolished in the 1950s in order to build public housing. Rapturously received upon its release in 2005, it proved to be the first instalment in a loose trilogy about America past and present that subsequently took in My Name Is Buddy (2007) and I, Flathead (2008). Each new release found Cooder revelling in various roots music styles – from fairly straight-ahead blues to country-folk and bluegrass – to frequently devastating effect. After years of serving other people’s artistic visions, it was wonderful to have Cooder back in full effect. There is rage, frustration and a desperate desire for the whole-scale return of empathy and other core human values writ large throughout these 14 songs, with the titles themselves – ‘No Banker Left Behind’, ‘Quick Sand’, ‘Humpty Dumpty World’ and ‘Lord Tell Me Why’ – generally being an accurate indication of the lyrical contents therein. Musically, it’s perhaps the most direct of Cooder’s late-period works, with the blues influence more discernible than at any time since the 1980s. There are also fewer guests, with Cooder and his son Joachim handling the majority of instrumental duties – no bad thing given that Cooder’s guitar parts on the likes of ‘Humpty Dumpty World’ and ‘I Want My Crown’ are some of the finest and fieriest of his career. Ultimately, the tone is of sadness and resignation at the then-current state of affairs – but still with the small, distant hope that the tide could yet turn in favour of the many, not just the obscenely wealthy few. It could be compellingly argued that subsequent events have finally extinguished that hope, and in light of the damning comments made about the Republican Party on both Pull Up Some Dust… and its 2012 follow-up, Election Special, one can easily imagine Cooder’s sense of horror at the possibly terminal catastrophe of the Trump regime. We may soon find out for sure given that Cooder’s forthcoming album is being trailed as “a deft commentary on our ailing moral state”. Due for release on May 11, The Prodigal Son will feature a mix of Cooder originals alongside interpretations of songs by Blind Willie Johnson, Blind Roosevelt Graves, the Stanley Brothers and others. The two tracks to have been released at the time of writing, ‘Shrinking Man’ and ‘The Prodigal Son’, both strongly indicate another blues-infused classic; a extended live-in-the-studio version of the title track posted to YouTube in March (https://www.youtube.com/watch?v=HEUIZWyieAk) is utterly spellbinding. On a path that is very much his own since the mid-Noughties, but one which holds the promise of a greater communal future, Ry Cooder shows no signs whatsoever of going gently into that good night. Now in his early ‘70s and with his first major tour in many years taking place this year, Cooder remains a master composer and performer, and we should throw every plaudit we can in his direction while we still have the opportunity.